Just a quick post to show you our cutting station. This is where all of our glass is cut and prepared. When we started we didn’t have a cutting system and just cut directly on the table. If you look closely you will see a wooden ruler that I screwed to the table as a guide. 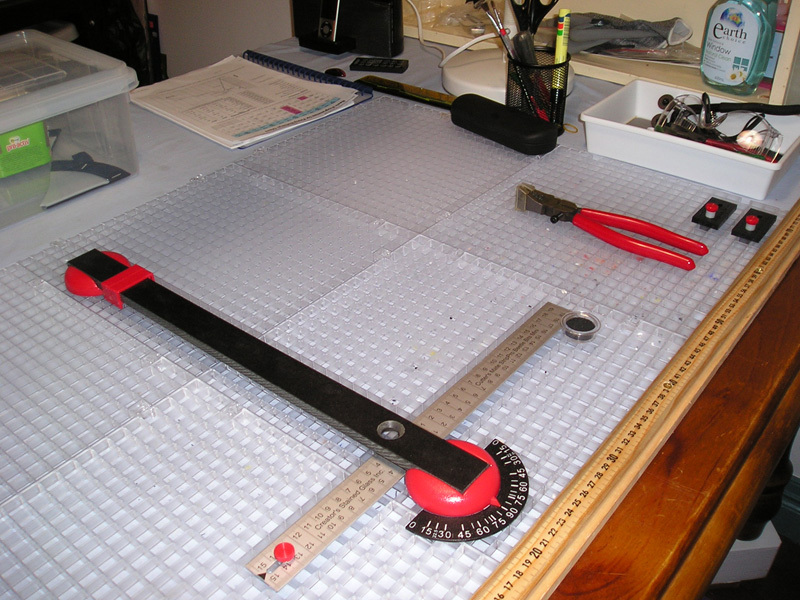 In addition I used a carpenters square for cutting straight pieces etc. It worked, sort of, but had some failings. I was endlessly cleaning up glass slivers and chips after cutting and sometimes during. If I didn’t clean it up I found my self laying new glass down on small slivers that I am sure scratched the new pieces, and certainly made the piece unstable. The carpenters square was too heavy and made it difficult to manipulate the glass. It also tended to slide when I was cutting and caused me to go off line. It became obvious this had to change. So off to the internet to do some research into what was available here in Australia. A usual, what is available generally isn’t necessarily available here in Australia. Sure, I could buy from overseas, but often the shipping is just prohibitive. Anyway, I did find a number of different types of cutting tools, and full systems, besides the normal glass cutters. My first impression, mainly because it appeared more often in my search, was the Morton system. This seemed to offer everything I thought I needed, though as an amateur I had limited experience to draw on to help with the decision. However, no matter how much I searched I couldn’t find any supplier in Australia selling the system. So I searched a little more and found the Beetle Bits’s Glass Cutting System. It actually looked very good, though finding information about it was a bit harder. I did locate a video on YouTube that showed it in action. The whole system looked good so back to searching for a supplier. Bingo! There was a supplier, just one that I could find, but best of all the price seemed very reasonable. Problem solved. I can honestly say we are very happy with the Beetle Bits system. The waffle grids are excellent for holding all those pesky glass slivers and chips that build up. I haven’t emptied the grids yet but then I always pick out the larger chips and collect then for use later. 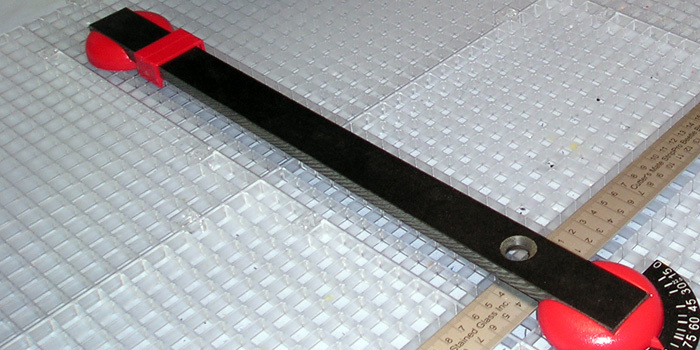 The system as a whole is great for repetitive cutting of strips, angles etc. 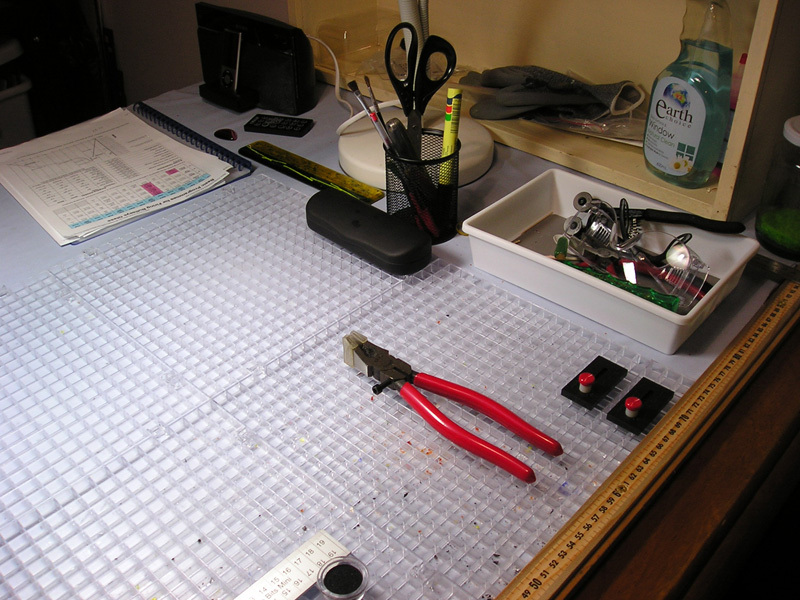 Regards the rest of the cutting station, you can see in the photos I place all my main tools in a tray on the side. The tray is a lot easier to work with. There is a wire toothbrush holder for things like pens, markers, scissors etc. There is a small shelf unit sitting on the end of the table for storing a variety of items, cleaner, gloves and anything else we need to be close at hand. Of course, there is the iPod player. Working without music is no where near as enjoyable. You can just see the base for a flexible fluro light over the station. This provides good direct light, though it could be a little stronger. Overall, the station is working well at this time. I expect we will make changes in the future. So where in Australia did you buy your beetle bits from! Hi Brenda. Sorry, can’t remember and couldn’t find the receipt. Thought it was glassfusing.com.au but theirs is the Ultimate and is slightly different. If I can find the receipt I will let you know. I have just ordered my Beetle Bits from Perth Art Glass. It was the only distributor that I could find in Australia, therefore eliminating the exorbitant shipping costs from the States. Very helpful staff…would highly recommend them.